*the kroot enter their own pods, kerak enters max's* "We go to the fight now yes?" "Yes, we're going to the fight"
kerak: "Good. We're running out of fresh meat." Max: "We restocked days ago"
Kerak: "Not fresh. Four day old." Charles: aye. My own little recipe. Laurence: "Really? can i see? I have a fondness for poisons." Charles goes over to a desk and unlocks a drawer on it, pulling out a sheet of paper with notes on it. he hands it over. "That stuff'll bring down even a dark eldar Pain engine in a few shots"
"Really?... now that is impressive... From what i gather... its a neurotoxin?" "Partially. You'd be amazed what you find in a haemonculus den. Even more amazed when you learn to synthesise the stuff. Wasn't gonna leave that place standing, so I left a rather explosive surprise for the owner after I took what I could." Laurence: "That makes two of us who've learnt a few tricks from the haemonculi." Laurence: "Although i dealt with the issue slightly different." Max: "This is where the fun begins"
Laurence: "Kill them all and take everything?" "In my case, It was take useful things and then blow the place, which I assume killed them all so....not too different"
Charles: Indeed. There are many xenos who deserve to live more than we imperials give them credit for. Haemonculi are not among them. Laurence: "... Struggling to think of a race i wouldn't wipe out." "Remove the influence of the ethereals and the Tau are savable. Eldar have their uses depending on the situation. And as for others.... well how about your little friend?" Laurence: "He's human enough for me. The tau are weak, and the eldar are.. well they're the eldar. They fucked a god into existence and yet continue to be assholes with a superiority complex." "The tau are only weak cause their empire is small. And have you heard of the new group of eldar, Laurence? The Ynnari?" Laurence: "And because their genetics are terrible. And no." "Well. Fun fact. 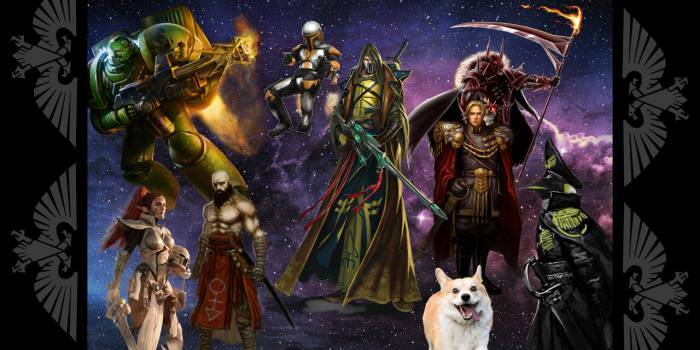 There's a new eldar faction, with members from all three of the primary. They worship the now awakening god of death, Ynnead. And it was the Emmisary of this god who aided Cawl in helping the lord commander wake up from his daemon induced slumber. The Ynnari are able to house the souls of the dead, without a soulstone, within their bodies, empowering them to greater feats in battle. Very dangerous. Laurence: "So the lord commander is sustained with xeno tech... Interesting... A new god? That complicates things." "Not Xenotech. Xeno Psychic abilities restored him. Yvraine, her name is, is a powerful psyker of this death god, and used her powers to restore his soul, as Cawl's technology restored his body." Laurence: "Hmmmn... We'll have to watch him for any sign of xeno influence..."
*the kroot warriors, arrayed beside kerak, clad in the same heavy armour, a full 11 strong warriors. * Kerak: "What to do cap-tan?" Charles: I did my own digging. He's clean. The Eldar simply saw that with cadia fallen, The imperium is in a bad situation. And if we fall... well, nothing to distract slaanesh's followers from finally ending their dying race. Laurence: "Using us as a meat shield as usual... i'll have to have a word." Charles: quite. However, at least they're being blatant about it this time. And it still helps us. Laurence: "I will admit that the eldar have been useful in the past. And their biology is remarkable."